Choose Title Mr. Ms. Mrs. Please specify here the total amount of passengers you are booking for. The base price is valid for up to 6 passengers and there is a charge of U$15.00 for every extra person. 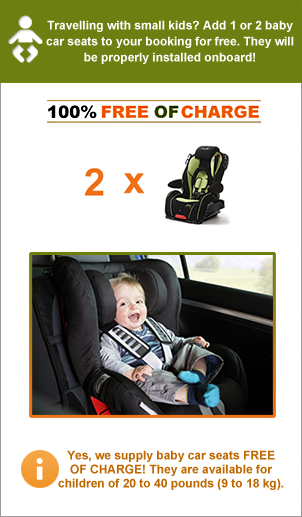 In case you are travelling with babies you can also order here up to 2 baby car seats free of charge. They can be used for children of 20 to 40 pounds, (9 to 18 Kg). Please enter here the date, your pick up location as well as the time at which you wish to be picked up by us if your pick- up or drop - off location is a private residence or villa, Please specify the address in the field "Special request" below. Please enter here the date and the time at which you wish to be picked up by us for your return transfer. The Pick-up place will be the same as the Drop-off place of your 1st transfer. If you need to be picked up at a different place, please specify it in the field "Special Requests"
Please choose here any of the following products if you would like to arrange for drinks on arrival. 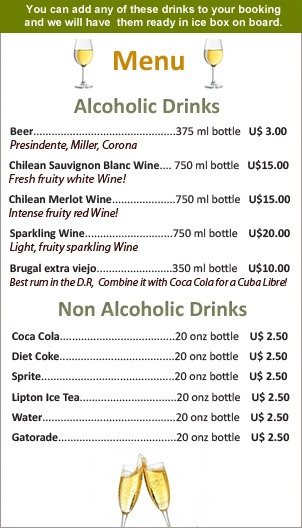 Add the ones you would like and we will provide you with a cool box, ice and the selected drinks which will be ready on board at the time of your arrival.